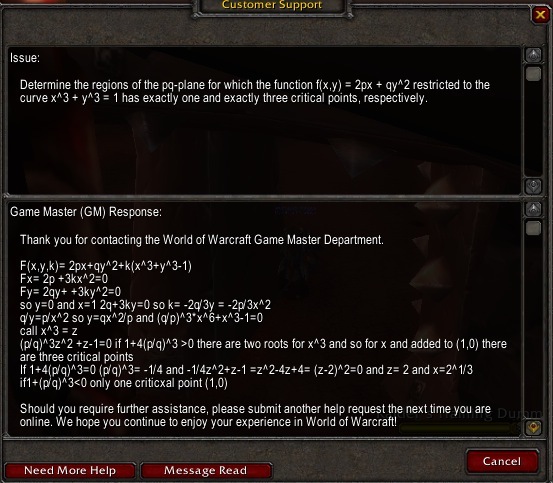 Math is hard, but if there's anyone out there that can help it's a World of Warcraft GM. Here's a scenario: You're stuck on a particularly tough Calculus problem. It's the last one you need to finish before you can put away the books and get cracking on completing the quests in Uldum or rough it up in Tol Barad. Your guild is calling for you, you already logged into the World of Warcraft and can just barely resist the temptation to start owning Horde with your new Worgen Warlock. "I just need to get this done. Can't anyone help me?" you scream to no one in particular, but that's when a crazy idea strikes you. The WoW GMs can solve any problem, they even gave me back all of my gear, items and gold when my account got hacked last month. Surely one of these exemplary geniuses can help! They can bend space and time to their will, to them the calculus is a mere tool. "I can't believe that worked!" you say before snapping a screenshot and posting it to WoWbash.com with a caption reading, "Blizz does my math homework." Now, I don't if that's what really happened or if the picture is even real, but it doesn't really matter. Even if it's not true, it's still a pretty good story. Remember kids, if you're stuck with your homework, why not message your friendly neighborhood GM?